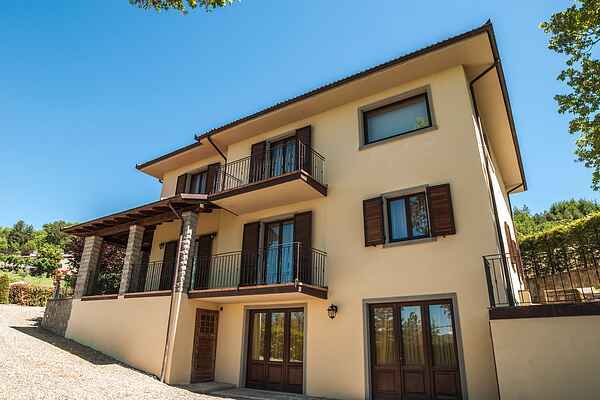 Beautiful villa with private pool in the province of Arezzo near Pratovecchio in the Casentino valley. The villa consists of two spacious apartments that are rented together. There is a lovely garden with a private swimming pool, perfect for a warm summer day. Pratovecchio is a quiet and charming town in one of the most beautiful valleys. Close by is also the Casentino Forest National Park. This is a beautiful untouched nature with hiking trails. This park is also the monastery of Camaldoli. The park is beautiful in all seasons, but especially in the fall because it is one of the most colorful forests of Italy. The Casentino valley is rich in history, art, good food and many outdoor activities. The valley is about 50 km east of Florence. You can visit castles of Pioppi, Romena and Porciano, walk through ancient forests. You can visit the Franciscan sanctuary of La Verna, the monastery of Camaldoli, and the towns of Stia, Pratovecchio and Castel San Niccolò. Villa Lonanno is suitable for a quiet and relaxing holiday.